Dr. Marco Wopereis, WorldVeg Director General (seated; left) and Dr. Fernando C. Sanchez Jr., Chairman of SEARCA’s governing board, sign the MOU. 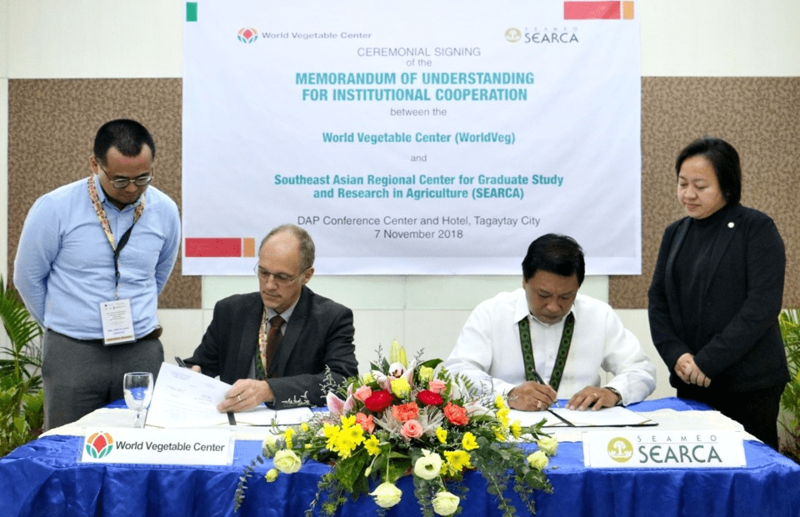 The Southeast Asian Regional Center for Graduate Study and Research in Agriculture (SEARCA) and the World Vegetable Center (WorldVeg) formalized ties for institutional cooperation through the signing of a memorandum of understanding (MOU) at the Development Academy of the Philippines in Tagaytay City on 7 November 2018. 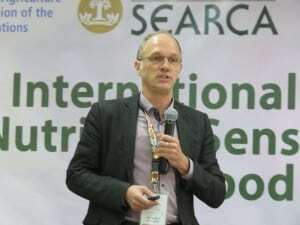 Signatories were Dr. Fernando C. Sanchez Jr. on behalf of SEARCA as chairman of its governing board, and Dr. Marco Wopereis, Director General of WorldVeg. 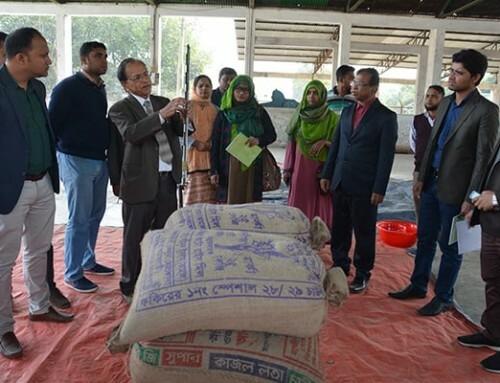 The signing ceremony was held on the sidelines of the International Conference on Nutrition-Sensitive Agriculture and Food Systems, 7-10 November 2018. 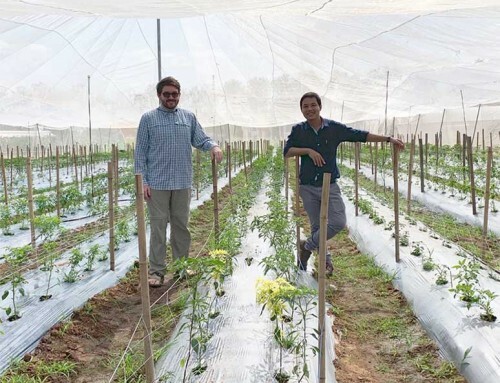 The Philippine government-hosted and Los Baños-based SEARCA is mandated to promote inclusive and sustainable agricultural and rural development through its core programs on graduate education, institutional research and development, and knowledge management. It serves the 10 member countries of the Association of Southeast Asian Nations (ASEAN): Brunei Darussalam, Cambodia, Indonesia, Laos, Malaysia, Myanmar, Philippines, Singapore, Thailand, and Vietnam. Timor-Leste is also served by SEARCA. 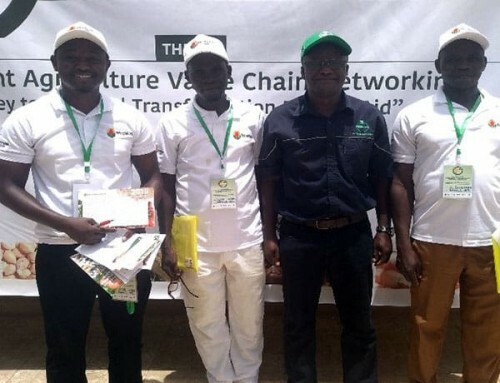 The World Vegetable Center, an international nonprofit R&D institute established in 1971, is based in Taiwan with five regional offices in Thailand, India, Tanzania, Mali, and Benin. 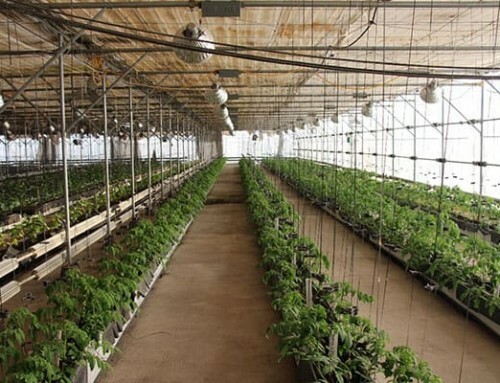 WorldVeg plant breeders draw on the wealth of genetic diversity in the WorldVeg Genebank to develop climate-smart, resilient, productive vegetable varieties with enhanced nutrition, tolerance to heat and drought, and better resistance to pests and diseases. These improved varieties ultimately lead to healthier lives and livelihoods through greater diversity in what we grow and eat. “The thread that binds us in this MOU is our common objective to push for a more nutrition-sensitive approach to agriculture and sustainable and diversified cropping systems,” said Dr. Sanchez. Dr. Wopereis with the SEARCA team. Dr. Fernando Sanchez, chancellor of UPLB, colleagues and friends from SEARCA, UPLB, ladies and gentlemen: Magandang umaga. It is a real pleasure for me to be here in the beautiful city of Tagaytay and being able to sign this important Memorandum of Understanding between the Southeast Asian Regional Center for Graduate Study and Research in Agriculture (SEARCA) and the World Vegetable Center. The World Vegetable Center was established as the Asian Vegetable Research and Development Center (AVRDC) in 1971 by 7 countries, including the Philippines and the Asian Development Bank. The idea was visionary, to establish an international center to address malnutrition. That was in the 1970s – a long time ago. But our mission, to realize the potential of vegetables for healthier lives and more resilient livelihoods, is now more relevant than ever. Worldwide, 2 billion people suffer from under-nutrition, be it lack of minerals, micronutrients, vitamins. Many of them are children. And children who suffer from undernutrition will never grow up to their full mental and physical potential. Astonishingly, at the same time we see widespread problems of over-nutrition and obesity, leading to rampant health problems, in particular cardiovascular diseases. Besides human suffering, the economic losses due to malnutrition are mindboggling. Ensuring people eat more diverse diets, including more fruits and vegetables, will be an important factor in tackling the malnutrition problem. We need more diverse and safely produced crops in farmers’ fields, and we need to ensure that produce can be sold at affordable prices. Or we need to find ways for people to produce fruits and vegetables themselves through home gardens. The conference we will attend over the next few days will surely provide new insights in nutrition-sensitive agriculture and food systems. The World Vegetable Center is determined to contribute to realizing the nutritional potential of fruits and vegetables. But WorldVeg cannot achieve much on its own. We are always looking for strategic partners. And it is clear that SEARCA is a very strong strategic partner. SEARCA is Southeast Asia’s center of excellence for agricultural science and education. The World Vegetable Center is the only international research center solely dedicated to vegetable research. WorldVeg is hosting AARNET, a collaborative network of agricultural research institutions in ASEAN. 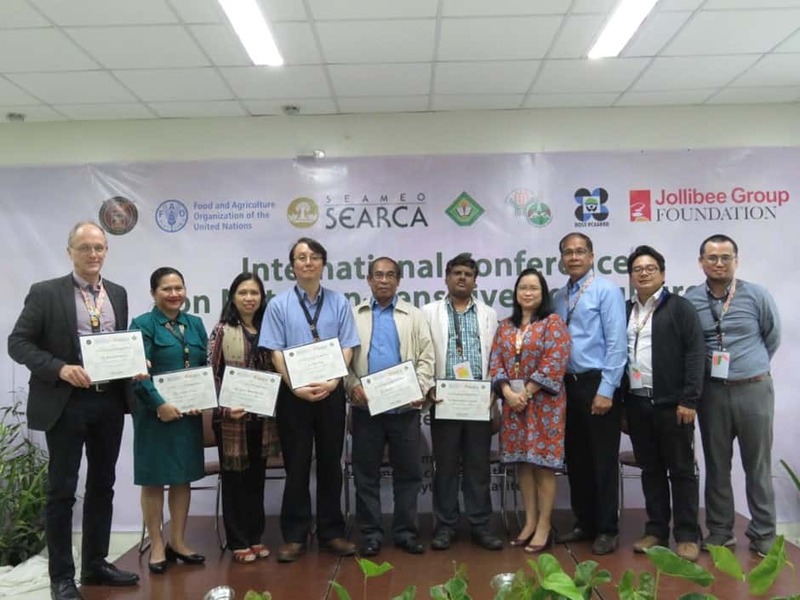 SEARCA is hosting the Southeast Asian University Consortium and through UPLB is linked to a global network of world-class knowledge institutions. By teaming up, SEARCA and WorldVeg will be able to access each other’s networks, develop joint research programs, and organize round table conferences to stir debate and come up with new ideas. We could perhaps also reflect on a joint scholarship program. Ladies and gentlemen, it is fitting that this MOU is signed during this International Conference on Nutrition-Sensitive Agriculture and Food Systems. I believe that a SEARCA-WorldVeg partnership will contribute significantly to greater diversity in what we grow and what we eat. I would like to thank SEARCA once more for the kind invitation to attend this workshop. I am very much looking forward to the presentations and discussions over the next few days and I am thrilled to have signed this MOU.